Right, left, top, bottom, center – Mix and match, you will get lot of positions to publish an ad, but then what’s the best place to keep the ads to get the maximum impact? Well, if the medium in question is blogs, then we have many tips available from those who tasted success, like this one from Digital Inspiration. One good thing with internet marketing is success can be easily measured here with a parameter called click through rate (CTR). However there is nothing like that in newspapers or tabloids, so the only way to know the reach of an ad is by getting the feedback from readers. In case of newspapers, the layout won’t change often and as regular readers are mostly used to it, they can simply finish off reading the newspaper turning a blind eye to all the ads. But still there is a way to make better impact through newspaper ads. One doesn’t need to climb the stairs of the newspaper publishing houses like The Hindu, Deccan Chronicle or The Economic Times for that. Instead a visit to the local newspaper agent, who manages the packaging and distribution of the newspapers to the individual household, will do the trick. Yes, it’s the pamphlet ads I’m talking about here. Once you open a newspaper the first thing that catches your attention is a small pamphlet falling down. Though it has a limited life time – From the time it reaches your hand to the time it reaches the trash bin – if the pamphlets are colorful and attractively designed, the chances of people taking notice of such ads are even more than the success rate of front page ads. Some times these ad pamphlets are kept in the inner pages and as you turn the paper to read the editorial views or the latest world news, you’ll come across an exciting discount offer from a local store. Again, the chances of this pamphlet getting noticed, is more than any ad in that page. Another advantage with these pamphlet ads is, one can easily reach specific target audiences through this approach. 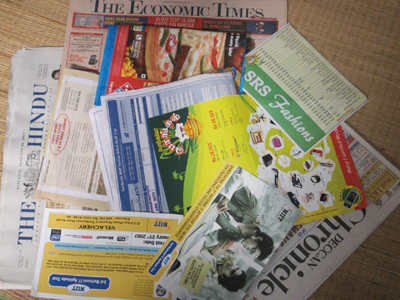 For example, a mutual fund offer ad can be kept in the newspapers in the areas where upper middle class residents are more and an ad for a two wheeler discount from the local automobile showroom can be used in the areas where middle class population is more.Well they are effective, only if one or two pamphlets are kept in a newspaper, more than that will definitely spoil the party, as it will end up only in irritating the readers. Well, these advertisement pamphlets may be cost effective but the legality of keeping such ad notices inside a newspaper is always a contentious question. Why not the newspapers themselves appoint their own people to do the packaging and to keep one or two ad pamphlets themselves instead of leaving that opportunity to the agent? As far as the ad publishers are concerned they will get their money’s worth with these pamphlets than a direct ad in a newspaper. Well said Siva. But even if the newspaper company do the packing, the agents will have to re-shuffle or repack it again for the paper deliverers. There again, they can insert pamphlets or get-rid of the company’s pamphlets. PS: Please remove the word verification. Muthu – Thanks for your comments. Reg. word verification, Google & others are giving this feature, because it is possible for spammers to enter comments automatically thru some program. I don’t want to take that risk, so I’m using that option. Pls do bear with typing additional five letters to protect against spam. These pamphlets are becoming endlessly irritating. Down with them. As for their scope, even the local temples are ‘informing’ people about the ‘meeting of devotees’ thru such pamphlets. I would want to kick the butts of those lazy morons sending them. Such mis targeted short cut ‘ads’ should never be encouraged. The poblem here is that, the news paper agent will put very few of them in the newspaper, as firstly takes his time and 2nd if doesn’t put it, he will sell them to a raddi shop for 4 Rs. per Kg, and make money out of it. Believe me from my experience I have faced this situation, and not only with 1 agent with several agents in different cities of the area, most of these guys are either college student or doing this as part time job, so they really are not honest towards this. Atleast in the newspaper it is sure that it reached x no. of people if x no. of copies are sold out, whereas here its not sure. So next time be careful while trying out this idea.